Reporter Madhumathi D.S. in The Hindu online infosite conducted an interview with Dr. K. Sivan, the Secretary, Department of Space and the Chairman of the Space Commission and the Indian Space Research Organisation (ISRO). Madhumathi noted that this has been a meteoric journey from a small farming village, Sarakal Vilai, in Kanniyakumari for K. Sivan, who has taken charge as the Secretary, Department of Space, and Chairman of the Space Commission and the Indian Space Research Organisation. From early education in a Tamil medium school, through a distinguished education and career in aerospace engineering, Dr. Sivan has played a significant role in ISRO's success with the agency's two satellite launch vehicles — the PSLV and the GSLV — especially in taming the elusive GSLV, which he called `the naughty boy' of Indian space. Just days after taking on new responsibilities, Dr. Sivan shared his plans for ISRO’s stepped up launch schedule and steps towards manned space flight. You have just taken charge as Secretary, Department of Space, and Chairman, ISRO and the Space Commission. In the country’s space program which area do you think needs immediate attention? 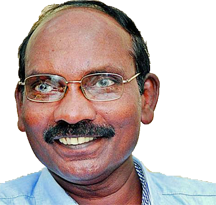 Dr. K. Sivan of the ISRO. We now have 43 satellites in space — for communication, Earth Observation (EO) and navigation. To meet the present national requirement, we need an equal number of satellites in addition. The frequency of launches must definitely increase. With the present launch capability, it will take us four years to make the required satellites and launch them. By then we would need to replace a few [older] satellites. It is like trying to catch up with a moving bus! This gap can be met only by increasing the launch frequency. Our aim is to meet the immediate requirement and for that, we have set 18 launches per year as the target. For more than a decade now, ISRO has been facing a serious shortage of satellite transponders due to an unforeseen demand from various users and leasing some capacity on foreign satellites. How will you tackle the gap? Yes, we are really short of around 100 transponders. But we are going to manage that with the new satellites that we will launch. We hope to bridge the gap very soon. One major satellite that we plan to launch in a couple of months is GSAT-11. It is around six tonnes [6,000 kg]. Once it is launched and starts working, most of our problems should be solved. It is getting ready and a launch date is not fixed. We will launch it from Kourou [in French Guiana, South America]. Do you see a need to change or re-focus activities related to development of launch vehicles, satellites and infrastructure? There is really no need to change anything. In ISRO we define our priorities and requirements very clearly and well ahead. We have a clear plan up to 2025 for launch vehicles and spacecraft. Beyond that, too, there is an outline as to which way we should go. We have a three-year action plan. Which missions are coming up this year? As a part of the three-year short-term action plan, immediate missions that we plan to do this year are the GSLV-F08 that will launch the GSAT-6A communication satellite [around February]. Then we will have a PSLV mission with navigation satellite IRNSS-1I. Then comes the second developmental flight D2 of GSLV-MkIII. It will launch the high throughput satellite GSAT-29. Later, GSAT-11, which will be our heaviest satellite as of now, will be launched from Kourou. The Chandrayaan-2 mission will be launched this year on another GSLV. At what stage are some of ISRO’s ambitious projects — the semi-cryogenic launch vehicle and the human space flight? For the semi-cryogenic launch vehicle, the engine development is going on. Some critical [sub-systems] are getting fabricated or tested. Our target is to test fly it sometime in 2019. The human space flight is really not in our approved programs for now. Before it is taken up, a human mission requires many technologies. We should develop them and be ready to execute it in a shorter period. For example, the crew module shaping, certain thermal systems and the CARE (Crew Module Atmospheric Re-entry Experiment) that was tested in a partial flight of the GSLV-MkIII in 2014. In the case of any disaster, there should be an emergency plan to rescue the crew from the capsule. One such experiment called ‘pad abort’ will be taken up this year. Studies related to life support systems, space suits, cabin pressure, oxygen levels, crew hygiene etc. should be completed. Last year, a plan was initiated to entrust the entire production of PSLV launchers to industry. A similar plan is under way to produce satellites. What is their status and how will this plan help? The process is on to give the major chunk of PSLV production to industry. Internal committees are looking at how to make work packages [i.e. distribute tasks.] The selection process is on. The first PSLV from industry should roll out in 2020. If this happens, it will take care of half our job. More people in ISRO will be available for doing R&D. Of the target of 18 launches per year, we would like to do 12 to 13 PSLVs, of which a major chunk would be through industry; three GSLVs and two GSLV-Mark IIIs. Except for defining the modalities, which will take time, I would say that it should not be an issue for us. Major industries such as HAL (Hindustan Aeronautics Ltd,) L&T, Godrej and MTAR have been already contributing to our program in big ways. A similar thing is happening in the satellite area also, although industry has already built one satellite under ISRO's guidance. Beyond these, we are developing a new launch vehicle to put small satellites to space. We want to hand over its technology and production to industry right from the beginning after doing one or two technology demonstration flights. We will do this through [ISRO's business entity] Antrix Corporation.